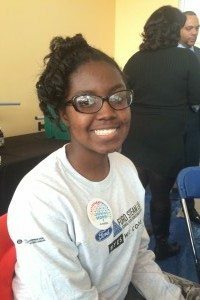 At the hackathon in Detroit Friday sponsored by Ford and #YesWeCode, the excitement was palpable. MSNBC was broadcasting live, kids from Detroit-area middle schools armed with dry-erase pens and sticky notes were busy brainstorming app ideas, and local dignitaries were passing through, some observing fruits of their sponsorship. At one point just after lunch, United Auto Workers vice president Jimmy Settles took over the microphone to announce that Ford and UAW were splitting the cost for every student participating in the hackathon to attend a summer coding camp at Henry Ford Community College in Dearborn, MI. “Today is just the start,” Settles promised. The kids making apps at the hackathon were competing for $42,500 in awards and scholarships. Judging their creations were #YesWeCode founder Van Jones, Detroit Free Press columnist Stephen Henderson, and Joy Reid, MSNBC anchor. The students also got a pep talk from Detroit rapper Big Sean, who talked to them over Skype from his tour in Japan. The hackathon’s first-place winners were from Patrick Henry Middle School in Woodhaven, MI. Their app, which they call Second School, allows students, parents, and teachers access to curriculum materials away from the classroom and enables better communication with teachers. The team won $15,000 for their school and individual scholarships of $2,500. Second place went to Clippert Academy in Detroit for an app the team calls Booktionary, which offers help with reading comprehension through quizzes and audio cues. They won $7,500 for their school. Simpson Middle School in Flat Rock, MI, won $5,000 with an app that helps students keep up with classwork when they’re out of school, and Fisher Upper in Detroit won $2,500 for an app that combines music and math learning through a gaming platform. She said she’s considering tech entrepreneurship as a fall-back career, but her heart currently belongs to biology. It’s her favorite subject in school, and she hopes to be a cell researcher some day. I also caught up with Kwame Anku, director of strategic development at Oakland, CA-based #YesWeCode, as he got a bite of cold pizza between harried live set-ups. The day marked his fourth trip to Detroit in almost as many months. Despite Oakland’s proximity to the titans of tech entrepreneurship in Silicon Valley, Anku said the city isn’t particularly advanced when it comes to increasing the number of women and minorities in tech careers. Anku explained a bit about the strategy employed by #YesWeCode, which aims to train 100,000 youth of color to program computers. First, the organization wanted “put stakes in the ground” in what he calls the nation’s power centers: New York, Los Angeles, and Chicago. Van Jones, however, had another idea in mind: to use the cities of Detroit, New Orleans, and Oakland as the organization’s true proving grounds. #YesWeCode had a fortuitous meeting with Shawn Wilson of the Ford Motor Company Fund, and it began officially engaging with Detroit. “To transform the community through coding, you have to do it in the middle of the country, because then, from there, we can do it anywhere,” Anku said. Anku said he envisions a new kind of tech-focused teaching corps taking root in Detroit, where recent college graduates—he specifically referenced graduates of HBCUs (historically black colleges and universities)—could come to Detroit and teach coding for a few years. This sounds like such a fun experience for 8th graders. I definitely wish these events were around when I was that age. I’m still getting to go to ones for my own age group at least. I’ll be doing the Hack the Home Hackathon (http://bit.ly/1Bhackthehome) hosted by FirstBuild. Should be a lot of fun. I’m looking forward to it. That sounds awesome. I was hoping it was in Michigan, but I see it’s Louisville, KY. Good luck!